Food and weather. Any mathematically inclined cook will tell you the two are inversely proportional: Heat wave, ice cream. Chilly rain, stew. After a handful of Indian summer days in October, blustery weather and frigid rain has finally set in. Not wanting to stray far from home, I headed to the Chinese grocery store for kabocha (pumpkin), gobo (burdock root) and pork shoulder. I love kabocha pumpkin for its creamy texture, petite size (easy to handle), and quick-cooking (when compared with the other squashes of the season). There’s a heartiness and sweetness to its yellow flesh, plus you can eat the nutritious green skin. 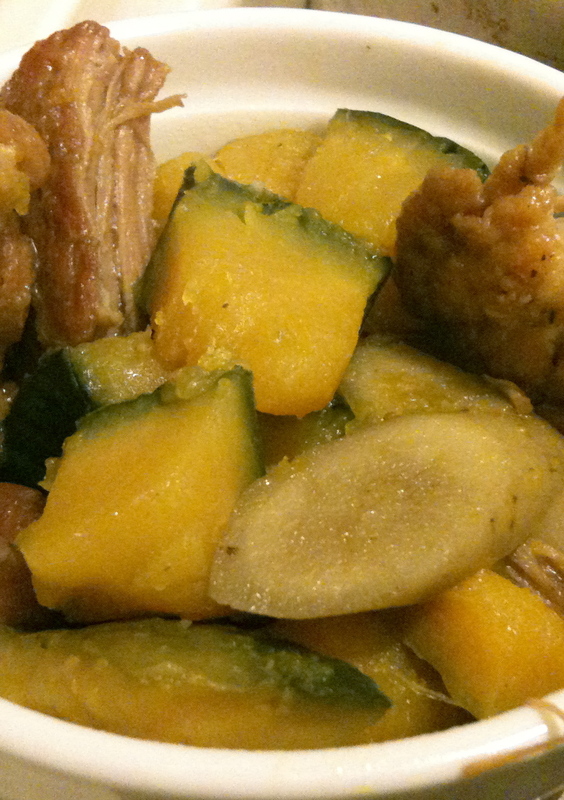 Kabocha is a favorite of the Japanese, who serve it simply boiled, hot or cold as a vegetable side dish. To make it a complete one-pot meal, I decided to braise some pork shoulder with the kabocha and an earthy Japanese root vegetable called gobo. Served over steaming hot white rice, this Japanese stew becomes the highlight of any rainy evening. Cut meat into 2-inch pieces and pat dry with paper towels (do not rinse). Spread meat on a large piece of waxed paper or the butcher paper it came in. Sprinkle flour over meat, toss to coat, then shake meat in a colander to rid it of excess flour; do in batches if the colander is small. Coat bottom of a 5- to 7-quart Dutch oven with a thin film of oil and set pot over medium-high heat. When oil shimmers, add enough meat to cover bottom in 1 layer. Cook, without stirring, until meat lifts easily from pot with tongs and is well browned on bottom, about 5 minutes. Turn and brown on the other side, about 5 minutes more. Transfer meat to a plate and continue with remaining meat, adding more oil to pot in between batches as needed. When last batch of meat has been removed, add some of the dashi to pot, stirring to released browned bits. Return meat and any accumulated juices to pot. Add gobo and all of the remaining ingredients except for the kabocha to pot. Reduce heat, cover, and simmer 60 minutes or until meat is tender. Meanwhile, with a large, heavy knife, cut the kabocha in half through stem end. Scoop out and discard seeds and strings. Cut kabocha into 1-inch chunks. 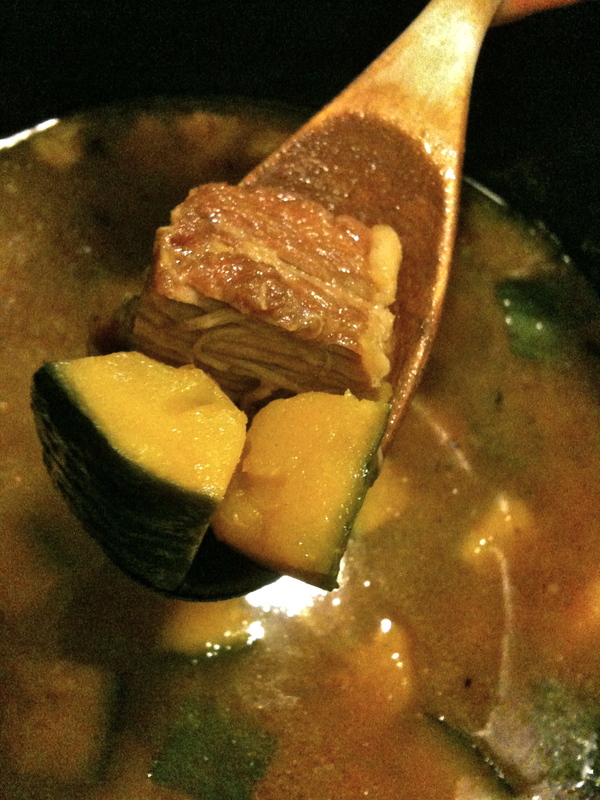 After meat has cooked 1 hour add kabocha to the pot. Let liquid come to a boil, then reduce heat, cover, and simmer 30 minutes more. Serve over white rice. As a 4-year old, the most coveted candy on earth was Tomoe Ame, a small turquoise and orange box filled with chewy pale pink candies that came wrapped in magically edible rice paper. The candy itself was ambiguously fruity and stick-to-your-teeth sweet, but none of that mattered because each box promised an “Amusing Toy Inside!” — usually a cat sticker. It was like Crackerjacks for Asian kids. The adult (and super awesome) version of Tomoe Ame would have to be Chi Chi Dango, a simple coconut flavored mochi made of mochiko (rice flour), sugar and coconut milk. Once baked, the ingredients form a sweet sticky rice cake that you can cut into bite-sized pieces, dust in flour, and wrap like over-sized candies. Combine mochiko, sugar, and baking powder. In a separate bowl, blend coconut milk, water, vanilla, and 4-6 drops of food coloring. Gradually incorporate wet ingredients into the dry, mixing well. Pour mixture into a greased 9″ x 13″ pan. Cover tightly with foil and bake for 50-60 minutes at 350 degrees or until set. Let cool completely (preferably overnight, but ~4 hours also works), before cutting into bite-size strips with a plastic knife. Lightly dust the pieces with katakuriko. You may substitute mochiko, cornstarch, or kinako (soy bean flour) for katakuriko. 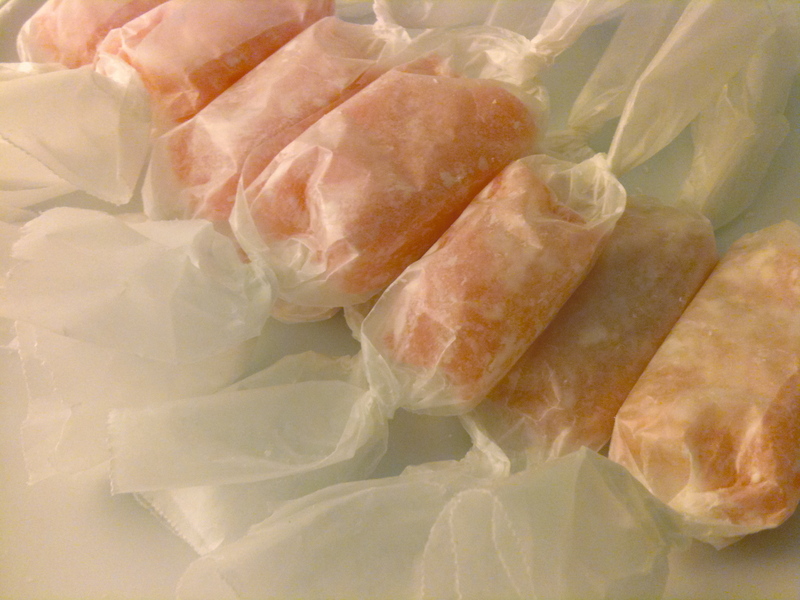 Wrap in wax paper like candies or store in tupperware. Lasts 2-3 days. Since then, I often daydream of visiting the last of my ancestral homelands to pay homage to their rustic kimchi factory… ah, someday! When I’m craving the stinky red stuff, I head to First Korean Market near my house. Their kimchi selection is tops in SF (cabbage, turnip, cucumber), and they have it readily available fresh in the banchan bar or jarred in many sizes. I especially love their crisp cucumber variety — heavy on the garlic and even heavier on fermented fish flavor. Last week, I was too lazy to walk over to the market and I decided to make my own fresh cucumber kimchi (non-fermented, crunchy, spicy and garlic-y). In Hawaii, you can buy this kind of kimchi at the grocery store — here in Cali, the Koreans only make fresh cucumber pickles that are mild, sweet and mixed with sesame seeds. Wash unpeeled cucumber, cut off ends and cut into bite-sized pieces. In a nonreactive bowl, layer the pieces with a generous sprinkling of salt between each layer. Toss and stir to distribute salt. Allow to sit for 25 minutes, then rinse off a piece and taste. If too salty, wash cucumber in cold water and proceed. If not salty enough, allow to marinate longer (I did 45 minutes). When the flavor is right, rinse in cold water. In a bowl, stir together Korean red pepper, sugar, garlic, ginger and green onion. 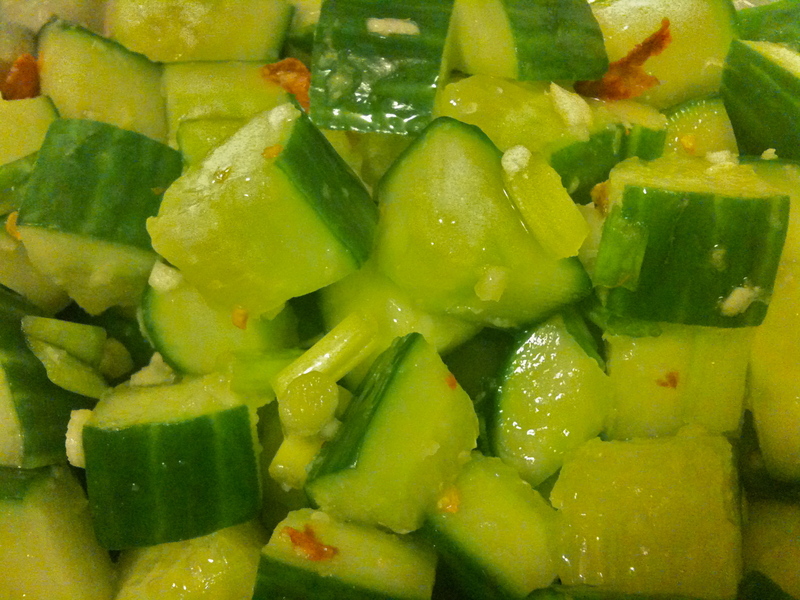 Add cucumber, toss well. It will lose crispness after 24 hours, so I’d advise you to eat it right away. Store in the fridge.